Boiler Operator, Electrician, Washerman, Tier Attendant and Greaser posts are in this NUHM SKIMS Srinagar Recruitment 2018. Candidate's selection is based on personal interview. Short listed candidates only called for interview for this SKIMS Srinagar Mechanic, Masalchi, Attendant, Nursing Aid Jobs. 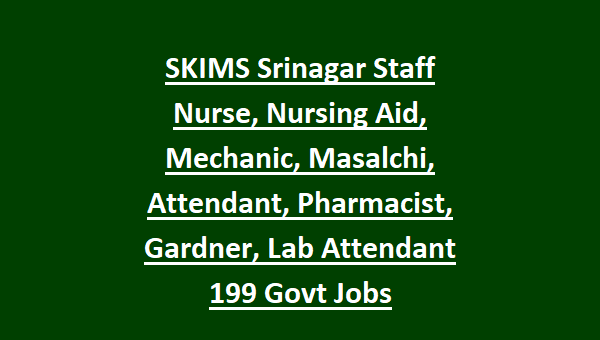 Online applications only accepted for this SKIMS recruitment from 10-08-2018 to 10-09-2019. Online Application will be accepted through SKIMS official website of www.skims.ac.in. For more details regarding this NUHM SKIMS Srinagar Recruitment of Mechanic, Masalchi, Attendant, Nursing Aid and Staff Nurse and other jobs information is given below. Post Name and No of posts details are given below for SKIMS recruitment 2018. Age limits cutoff date is 01-08-2018. Upper age limit is 40 years for general, 42 years for PH candidates, 43 years for SC/ST/RBA/ALC/Social Caste and 48 years for Ex Serviceman. Candidates will be shortlisted based on experience and marks percentage. Those shortlisted candidates only called for SKIMS interview. 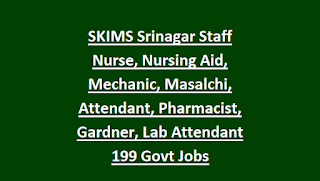 Online applications only accepted for this SKIMS Srinagar Jobs Recruitment of Mechanic, Masalchi, Attendant, Staff Nurse and Nursing Aid Pharmacist, Gardner. Official website of SKIMS is www.skims.ac.in.